Little Boy Lost by Marganita Laski was the book for discussion on Sunday’s Walking Book Club. It was a drizzly day but actually the weather was to thank for a particularly pretty walk, as we found a sheltered route which took us off to quiet and wild bits of the Heath, as opposed to our usual busy Parliament Hill climb. 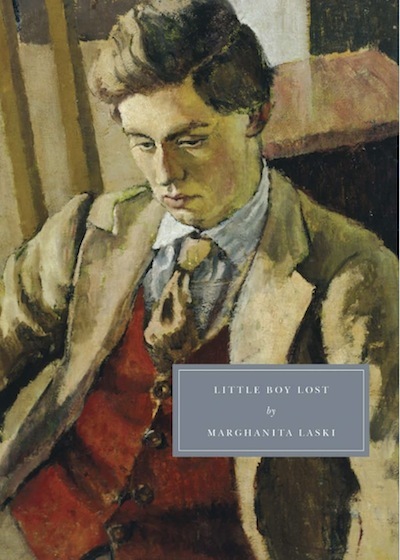 Little Boy Lost is published by the wonderful Persephone Books, known for publishing ‘domestic’ fiction, largely about women in the early- to mid-twentieth century. Somewhat unexpectedly then, Little Boy Lost, though written by a woman, is about a man. Hilary, a poet and intellectual, goes to France after the Second World War to look for his lost son. He has only seen his son once, as a baby. Through various complicated backstory twists, his son, now a child, is somewhere unknown in France. Pierre, the husband of a friend of Hilary’s wife, turns up and explains that it has become his life’s mission to discover the whereabouts of the missing boy. Later, when Pierre thinks he might have found the boy, Hilary is summoned to France to try to identify him. One of the biggest questions in the book is whether or not the boy is Hilary’s son. Will Hilary recognise a family resemblance or mannerism? Will the boy remember anything about his earlier childhood, or his mother? What counts as conclusive proof? Hilary is adamant that he will only look after the boy if he is his son. Of course when we meet the boy in the orphanage, a poor little thing in ill-fitting clothes: ‘its sleeves were too short and from them dangled red swollen hands too big for the frail wrists’, he is so pitiable with his poor circumstances and good nature that we long for Hilary to take care of him, regardless of his parentage. Laski has set up a tricky opposition here: the reader wants Hilary to adopt little Jean, and yet Hilary stubbornly persists in searching for proof that he’s his son. So we don’t particularly like Hilary, for this seemingly selfish behaviour against this child’s innocence, and I know you’re never supposed to say things like you don’t like a character, or found a book difficult for not liking a character, but surely it is vital to empathise with a novel’s main protagonist, and when the main protagonist persists in not doing what you want him to do, this can be problematic. It would be wonderful beyond words, he told himself dreamily – and then he realised what he was thinking. It can never be like that, he said, there is nothing left in me to make it possible that it should be like that. The traitor emotions of love and tenderness and pity must stay dead in me. I could not endure them to live and then die again. It would have been better never to have been happy, never to have felt love and tenderness and all those things, than to have known them and then lost them. So Hilary is afraid of feeling, of opening himself up to being hurt again. If the boy isn’t his son, then he is let off the hook. This glimpse of the stories of these other boys opens out Hilary’s quest to encompass, in a flash, the fate of the many many other children and families whose lives were turned upside down by war. Elizabeth Bowen wrote in her review that this is the story of ‘every lost child of Europe’, and certainly here you suddenly see the awful bigger picture. I found this to be one of the most moving moments of the book, made all the more so by the way it was casually thrown in, almost in parentheses. Why else does Laski choose to put Hilary in such a predicament about the boy? Early in the novel, Pierre tells Hilary about a conversation he had with his wife in which she argued for the importance of acting as an individual rather than subordinating your morality to a group. The only good thing we can do, the only goodness we can be sure of, is our own goodness as individuals and the good that we can do individually. As groups we often do evil that good may come and very often the good does not come and all that is left is the evil we have pointlessly done. We each did under the Germans what we were capable of doing; what that was, was settled long before they arrived. Now he found himself the leader of a thousand men who were strangely leading him to be all the many things he was not. It’s the opposite perspective. In The Narrow Road, this realisation happens when the protagonist turns down an offering of steak, in spite of the fact he is starving in a POW camp, and insists on it being shared out. Hilary in Little Boy Lost, by contrast, tucks into Black Market steak at a French hotel, managing to assuage his guilt about the terrible deprivation of the orphanage rather easily. Little Boy Lost is a novel about how an individual makes choices, how his moral compass swings and wavers during and after the War. We walking book club readers all wanted Hilary to adopt the boy regardless of his parentage, as do many of the respectable characters in the novel, but Laski insists on Hilary choosing for himself, as an individual, rather than giving into pressure from anyone else (the reader, or another character). The decision, when it happens at last, is all the more powerful for being self-determined. I suppose ‘what you would have done in the War?’ is one of those questions that everyone asks themselves, wondering how we’d behave when challenged to the core by such a dreadful situation. Laski shows us here that it isn’t just wartime that provides a challenge; big difficult decisions persist and we must choose what we – as individuals – feel to be good. I know it’s not officially time for a new post until Monday … but I was so thrilled with these pics of Emily’s walking book club, I thought I had to show them off right away! 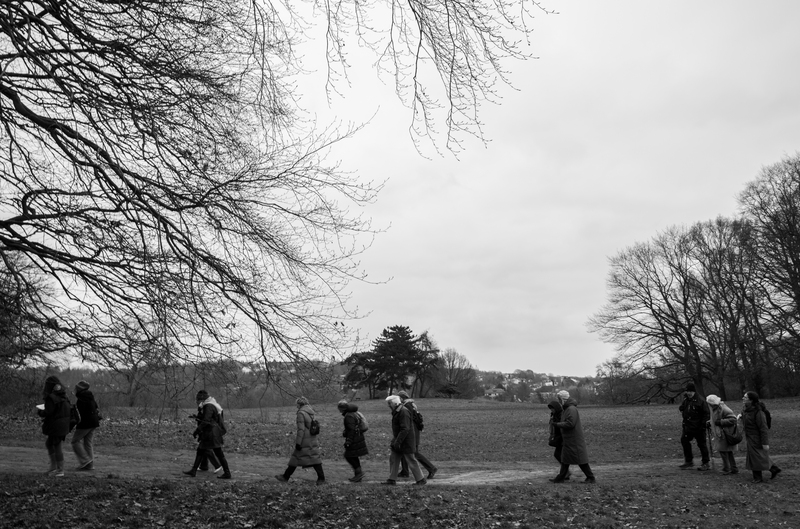 Thanks so much to the lovely Andy Tyler, who took these photos on Sunday’s walk – when we were discussing The Blue Flower by Penelope Fitzgerald. Can you believe he came straight to Hampstead Heath from Gatwick, having just got back from Las Vegas?! 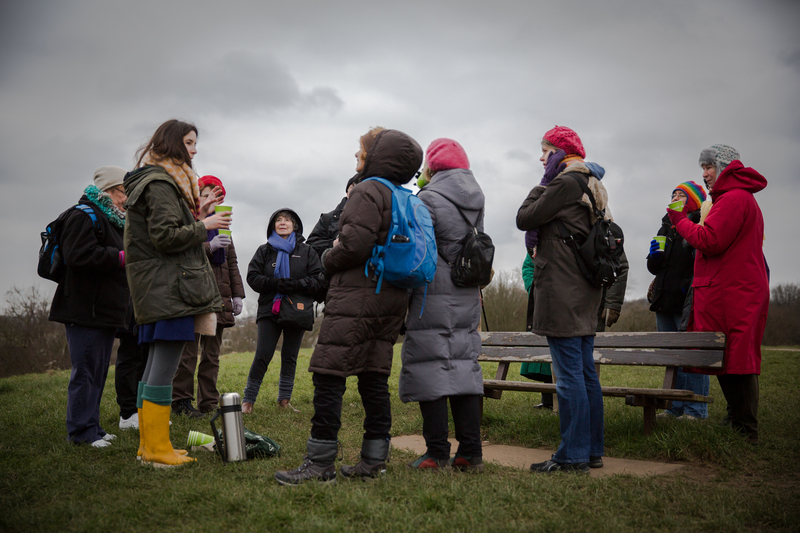 Apparently it was a little bit colder on the Heath than over there. Chatting our way up to the top of Parliament Hill. Rewarding ourselves with hot chocolate and an amazing view. Time for a little reading – the book was The Blue Flower by Penelope Fitzgerald, which I wrote about in Monday’s post. Off we go, across the frozen ground. We usually end up in twos and threes as we chat away about the book. Gosh it was windy as we set off from Parliament Hill. That’s Highgate in the background. Not sure why but this bleak beautiful picture makes me think of soldiers in the First World War… we were certainly battling the elements. I feel very remiss in not having posted anything for over two weeks. The suspense from last time’s Emily Game cliffhanger question must have become near unbearable! The answer is Midnight’s Children by Salman Rushdie, thanks to Saleem’s magical power. This blog hiatus has been thanks to the happy circumstance of having been in a Spanish villa with friends, and without internet. The villa is in a beautiful part of Andalucía, on the outskirts of a national park. We lazed by the swimming pool looking out at a magnificent hilly backdrop, occasionally spotting a stag in the distance, or an eagle soaring overhead. The garden was planted with thick bushes of rosemary and lavender, so the smell – especially after the sprinklers played their 1.30am trick of turning themselves on for a while and getting us and everything else very wet – was intoxicating. As was the vast amount of sherry that we drank, from as soon as we awoke till when we went to bed. He sat there silent and bearded, showing no signs of enthusiasm. And he must have been even more relieved at making his escape. When, three years later, Leonard and Virginia Woolf were preparing to come out and stay with me, he advised them strongly against attempting it, declaring in his high-pitched voice that it was ‘death’. There were no plates. Each man, keeping his hat firmly on his head in the manner of a Spanish grandee asserting his equality to everyone present and to come, chose his section of the bowl, and after inviting myself and the others to do the same, dipped his spoon in it with great formality and began to eat. He continued eating till the partition that divided his section from his neighbour’s had worn thin, when he laid down his spoon and, as soon as the others had done so too, got up and washed it at the pitcher and returned it to the faja or red-flannel waistband where he usually carried it. I can’t pretend that this didn’t give me some ideas for how to eat our own meals, especially as one of them was an immense and delicious paella, in a gigantic pan which needed to be carried by a minimum of two people. But, aware of the risk of turning meal-times into prolonged versions of The Chocolate Game, I didn’t suggest it. Instead, we just occasionally put some rosemary branches on the barbecue. But, sadly, this is the moment when I have to confess to something a little shameful. I find it very hard to read when I’m on holiday. I know this is terrible! I feel like a fraud. Summer holidays are the time when most people find it easiest to read. June, July and August see the bookshop filled with customers buying stacks of paperbacks to read on the beach, or by a pool, or in a villa. And I – I who recommend all these books, I who have written about how important it is to read relevant books while holidaying abroad – I find it very very difficult to do it. Usually, at home in London, I read at least a book a week. I read as often as possible – in my lunchbreak, in the evenings, on my days off. If it’s a book to which I’m particularly addicted, I might even sacrifice cycling to and from work in order to get the extra tube commute time to spend a bit longer with the book. Why is it that on holiday, when all I do is laze around, I find it so hard to concentrate? After giving it much thought, I have decided that it boils down to being on holiday with friends. I know that over the past few years a vogue has arisen for thinking of reading as something of a social activity. This is the age of book clubs and reading groups. And yes, for sure, I love to talk to people about books. But reading – the actual process of reading the words on the page – surely has to remain a solitary activity. It simply isn’t feasible to expect to be able to read with lots of friends. Lazing by the pool all day with friends seems to me more of a blissful opportunity to natter, rather than to impose the solitude of reading. And, inevitably, even if one does try to read, some people will start to natter, and gosh it is so incredibly difficult not to listen to their conversation and to resist the urge to join in. Maybe, just maybe, if I were reading something like Harry Potter, I might be able to close my ears. But, frankly, lyrical and fascinating though he may be, Gerald Brenan doesn’t cut it. So I was rather ashamed to find myself at the end of the week, barely half-way through the book. I made a bit of headway on the aeroplane, but, frankly, as I’d only had three hours sleep the night before, it was hard to persuade myself that the time wasn’t better spent with closed eyes. And then I found myself back in cold, windy London with half a book about Andalucia left on my hands. I returned from holiday to enter an incredibly busy and intense period of work, for which I had to work from 7.30am till 10pm, three days in a row. 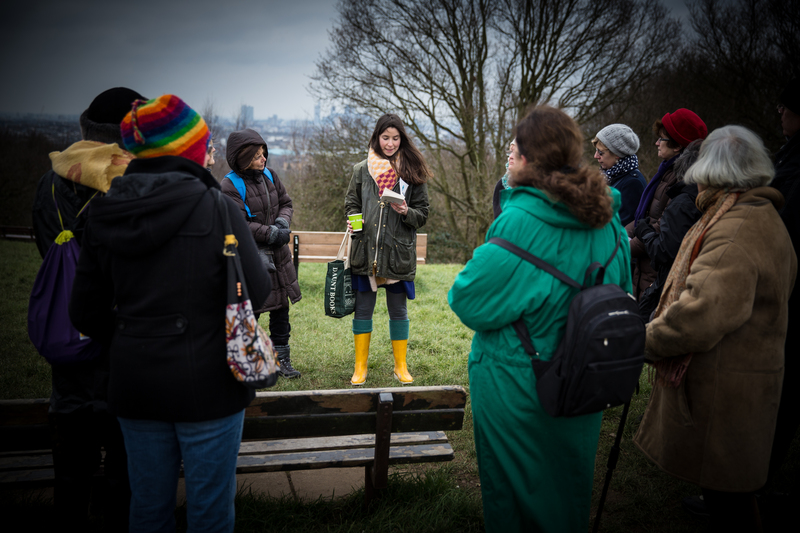 There was usually a break in the afternoon for a couple of hours, for which I’d wander, semi-catatonic, up to Hampstead Heath, search for a relatively-sheltered spot, try to tuck my hair out of the wind and try to read for a little while. Then I discovered that there is only one thing worse than reading about England while one’s on holiday abroad … and that’s reading about somewhere abroad – hot, rural and remote – when in England, back from one’s holiday. 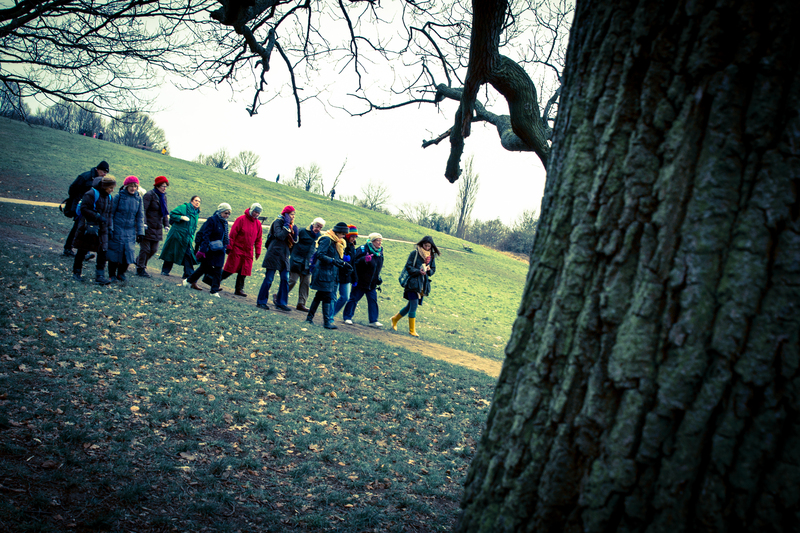 Hampstead Heath is usually one of my favourite spots. But, over the past few days, it has just seemed cold and autumnal, strangely busy and bustly in comparison to the empty landscape of Andalucia. The trees were wrong, the smells weren’t right, my smoked-salmon bagel was no more than a poor imitation of boquerones. 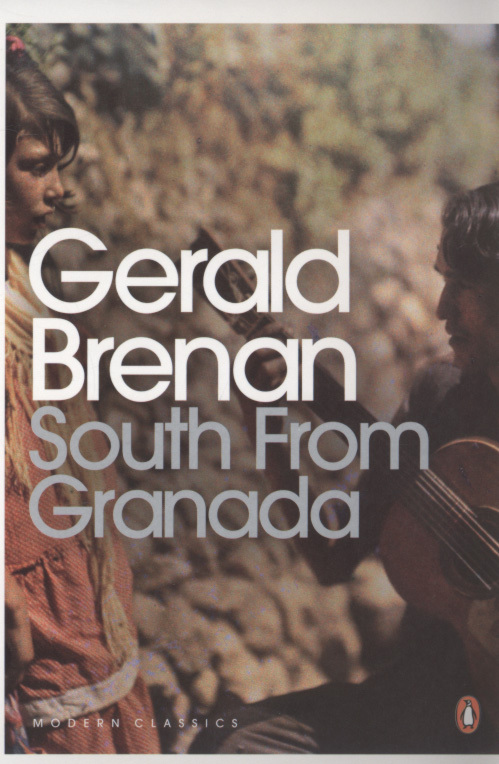 So now reading South from Granada is an exercise in nostalgia. I read it and can’t help but remember the blissful escape of last week – the heat of the Spanish sun, the sweet taste of sherry, the company of friends – and long to return. This is not helpful in the slightest, when I have to accept the fact that the holiday is over and real life must begin again. Last Monday was my birthday. Hence the absence of a post up here. (That and the fact that my energies had gone into a post for the Spectator, which you can read here). 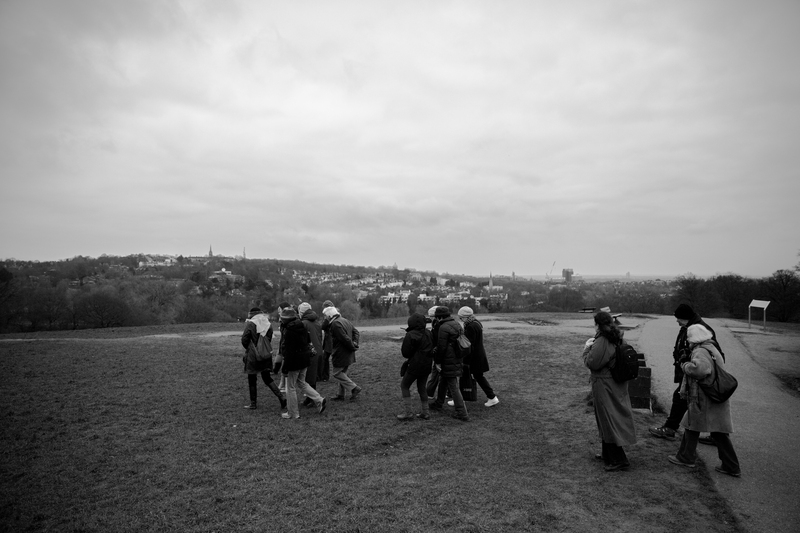 I spent my birthday going on walks – one across Hampstead Heath in beautiful sunshine; the other along part of the London LOOP in the sheeting rain. 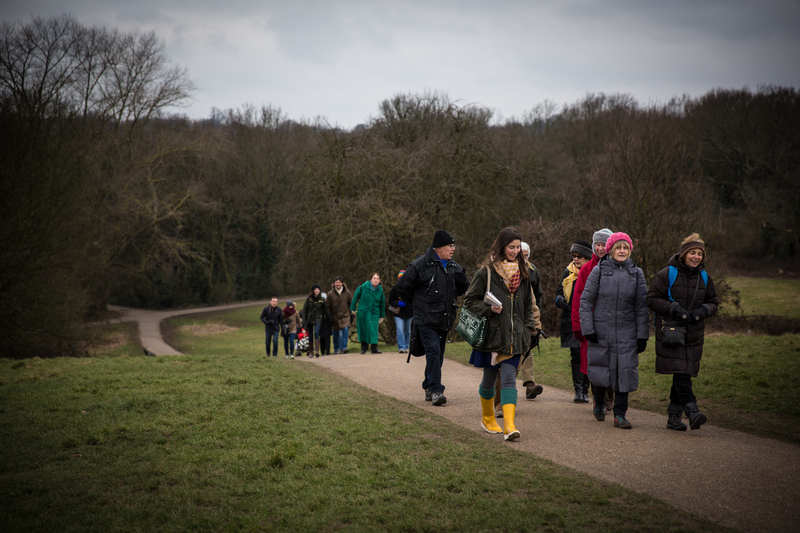 ‘Which way are we going?’ everyone asked me as we gathered by a corner of Hampstead Heath, bleary-eyed, clutching a thermos of hot toddy, early on Sunday afternoon. I had no idea, so we set off kind of diagonally right, and wandered more-or-less aimlessly, half-hoping to find Kenwood. 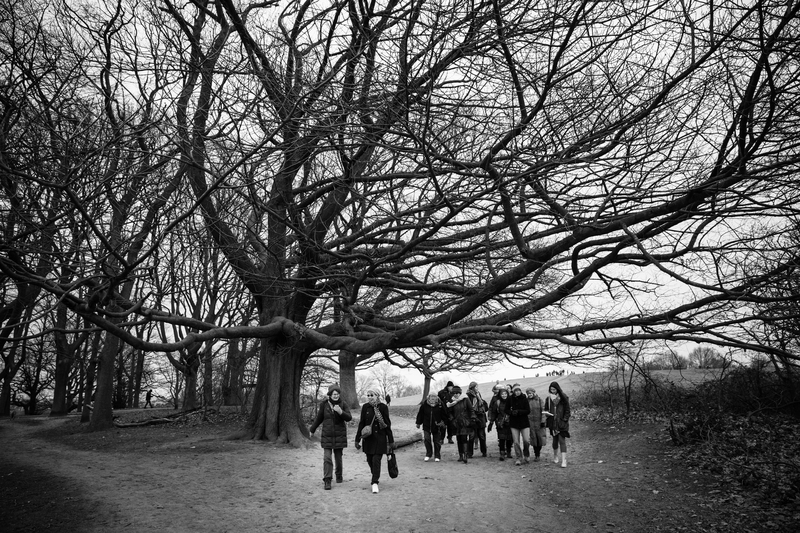 Out on the London LOOP, we walked through woods with stunning geometric displays of straight-trunked hornbeams, endless piles of autumn leaves, and toddled alongside pretty muddy streams, even a Medieval moat. Rambling was a favourite metaphor for thinking and writing … It suggested a leisurely excursion without a distinct goal, and with time to take in the view. It was a principled opposition to the stern linear progress Lytton Strachey so admired in Edward Gibbon, whose readers were not invited ‘to stop and wander, or camp out, or make friends with the natives’ and it opposed, too, the straight lines and rigid grids that had come to define modern design. This is from the charming, beautiful, and strangely addictive Romantic Moderns by Alexandra Harris, which has pleasingly just been shortlisted for the Guardian First Book Award. In this particular instance, Harris is writing about a talk that Virginia Woolf gave for the BBC in 1937, which Woolf titled, ‘A Ramble Round Words’. It seemed so serendipitous to be reading about the word and idea of ‘Rambling’, when just returning from birthday walks, which were really rambles – leisurely excursions without distinct goals and with time to take in the views. Of course, Woolf meant rambling in a metaphorical sense. 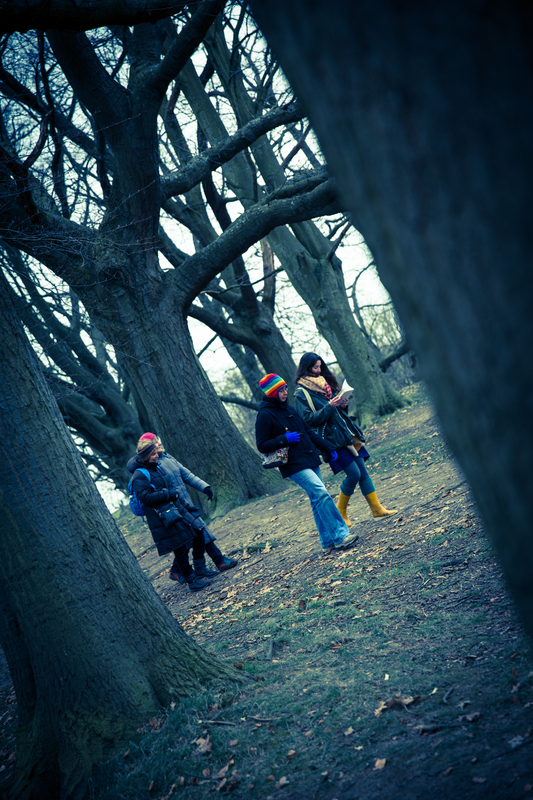 Her diverting walk is around words, not woods – hers is a meandering path of thoughts. But one of the best things about going on an actual ramble, is that then one’s thoughts ramble along as well. Etymologically, rambling meant travelling from place to place, without a fixed aim, ‘roving’, slightly before it meant to wander aimlessly in thought. But there is a mere sixteen years in it – from 1624 to 1640. Perhaps it was during this time that people began to appreciate the link between aimless walks and aimless thoughts. It is a relief to see that Woolf, with her Romantic sensibilities, lifted ‘rambling’ up, away from other rather pejorative meanings of ‘rambling’ – first of all, in 1551, ‘irregular in shape’, and then in around 1645 ‘inelegant’, ‘disjointed’, ‘loose’. Woolf evidently saw ‘rambling’ as something to be celebrated, to be encouraged. And irregularity in shape does, as Harris points out, utterly oppose the ‘straight lines and rigid grids that had come to define modern design’. It wasn’t until 1700 that ‘rambling’ was used in association with madness, in the sense of ‘delirious’, ‘raving’. And this is a meaning that Harris doesn’t pick up, in her saner appreciation of the word. Perhaps the ultimate rambling book is Adam Foulds’ The Quickening Maze. I don’t mean rambling in the 1693 sense of ‘waffling’, ‘loquacious’ – his is a short, neat little book, which one might well expect from an author who is also a poet. Although its shape masquerades as regular – split into different seasons – within these section breaks are numerous small disjunctures as the narrative jumps from one character to another. Irregular in shape in a marvellously creative way. It’s certainly the most poetic description of an aversion to food that I’ve ever read. The ramblings of mad minds are most keenly distilled in Foulds’ portrayal of John Clare. 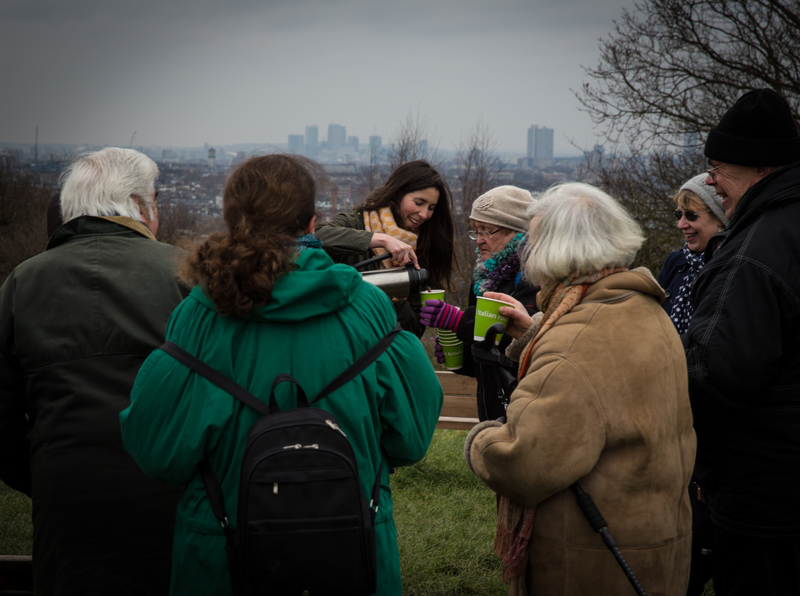 Clare, famously the ‘peasant poet’, loved nature and in The Quickening Maze he goes for walks in Epping Forest, which surrounds the lunatic asylum. As he rambles through the forest, he scrutinises it – taking in the view. Rather than needing a panorama, microscopic focus is shown to be just as astonishing. Clare passes, for instance, a blackbird with its ‘daffodil-yellow beak, sharp as tweezers’, or notices ‘the glaring, hooked darkness of holly buses, the long whips and shabby leaves of brambles beneath them’. And Clare’s mind wanders, rambles, just like his feet. But Foulds shows that these rambles aren’t always pleasant meanders; they are increasingly extreme flashes of madness. Clare thinks he is Byron, is periodically overwhelmed by the desire to fight, is convinced he has two wives … he is definitely mad. He just had to keep walking, boring through, shouldering the distance with the low grunting strength of a badger. Who knew once one reached the horrid age of twenty-seven, badgerdom would be so close?